A listed former Sheffield school is now the Gripple training academy, as well as its staff social club, after a sympathetic £1m conversion by the Sheffield manufacturer which has just hit a record £60m turnover. 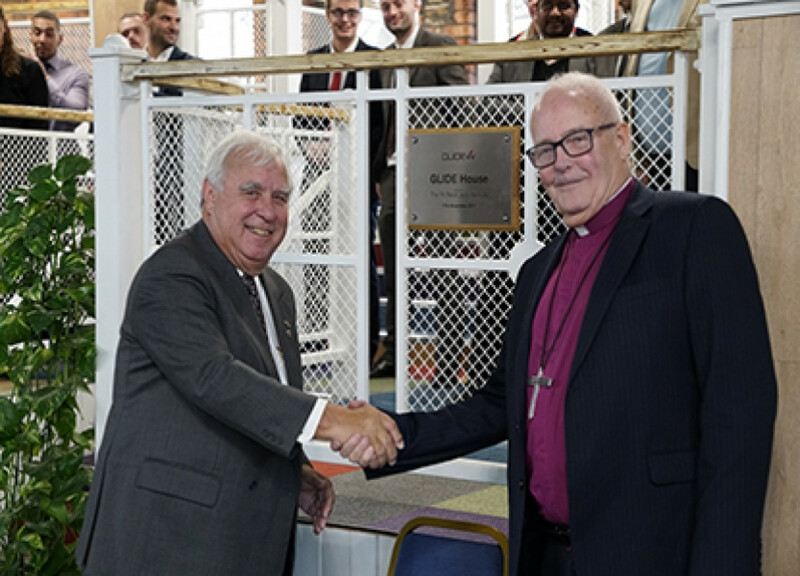 Officially opened by a retired Bishop of Sheffield, the Rt Revd Jack Nicholls, the familiar building on Attercliffe Common and formerly the popular Players Café, is now called GLIDE House, named after Gripples private company which represents all staff in the 100% employee-owned group of companies. The first floor of GLIDE House is home to Gripples People and Culture team where it will run training courses for staff from across the world who will learn about Gripple and even work towards NVQ qualifications. In the future the intention is that external staff will also benefit from Gripples training skills. On the ground floor, where a fascinating vintage school atmosphere has been created, there is a bar, restaurant and gym  all run by Gripple staff and open six days a week. Every staff member has a card which enables them to use the gym for free and to order food online, which is delivered to their workplace and paid for via their payslip! GLIDE, the Growth Led Innovation Driven Employee people-focused company, sets the principles and communications touphold the Gripple spirit with a rotating board, members of which are elected by their fellow shareholders. GLIDE House is within walking distance of a Gripple site on Carbrook Street and another Gripple group member, Loadhog on Hawke Street. Many staff are based at Gripple HQ on Savile Street East and at other group members, PMS Diecasting and GoTools in Rotherham and Laser Scanning in Chapeltown.